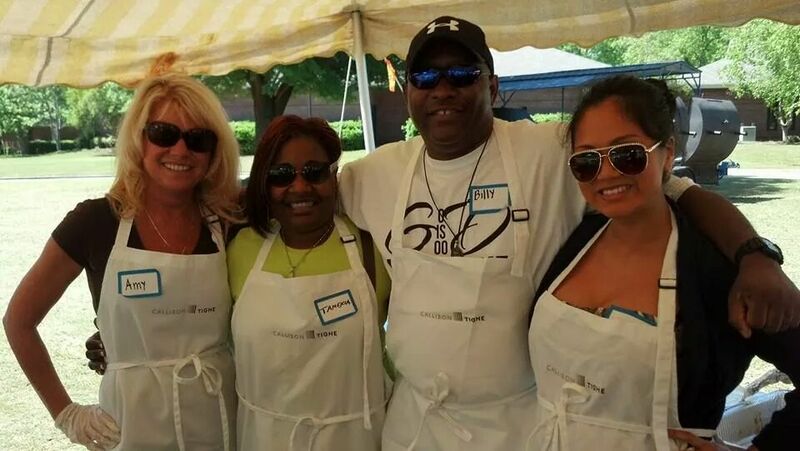 COLUMBIA, SOUTH CAROLINA – A team from Callison Tighe pitched in recently, serving the community by serving up barbecue at the sixth annual Cookout for Kids fundraiser for Epworth Children’s Home. The event lets the community see the campus, while also raising awareness of the services the facility provides as well as money to support the programs. Epworth Children’s Home is a group residential facility in Columbia that has helped children ages 4 through 18 for more than 116 years. The residents have been removed from their homes due to problems such as abuse or neglect. Four people from Callison Tighe were on hand for this year’s fundraiser: from left, Amy Abercrombie, Tamekia Hunter, Billie Green and receptionist Yurike Arifin. The four are not the only ones at Callison Tighe with barbecue experience. Every year the firm’s chefs spend a day roasting pigs for the annual Richland County Bar Association Judicial Barbecue. This year’s event was May 15 at Seibels House & Gardens in Columbia.